Level 3 Beauty Therapy students at Nelson and Colne College Sixth Form have been learning to manage and run their own PR event as a part of their course. The World of Beauty Therapy is exciting and glamorous and at its heart is an ethos of helping people to feel and look their very best. Nelson and Colne College has an outstanding reputation for providing the industry with the next generation of highly skilled therapists, who not only have the skills to transform and enhance their clients; but who also possess outstanding business and marketing skills in order to help them start up their own successful enterprises. 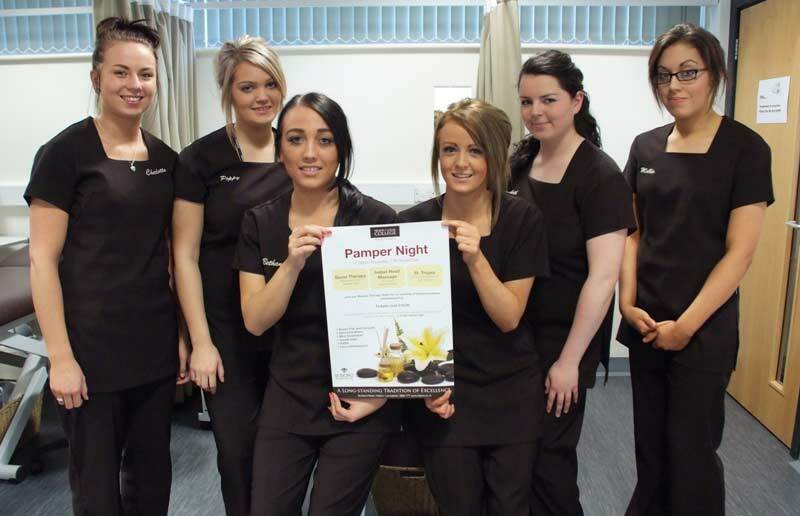 As a part of their Level 3 programme, Beauty Therapy students at the College are tasked with organising and managing their own event, promoting Beauty services to potential clients. After considering the sort of event they could plan, the students decided to host a specialist pamper evening, offering Hot Stone Massage, Indian Head Massage and St. Tropez self-tanning on Thursday 17th November. The class was split into groups, with each group responsible for specific parts of the event organisation; from planning the therapies on the night, to arranging PR and marketing to promote the event to the general public – all vital aspects of holding a successful event. The students were particularly interested in the learning about the business side of planning an event and spent time with the College’s own marketing department to gain advice on where and how to promote the event, designing leaflets and posters and the costs associated with this.